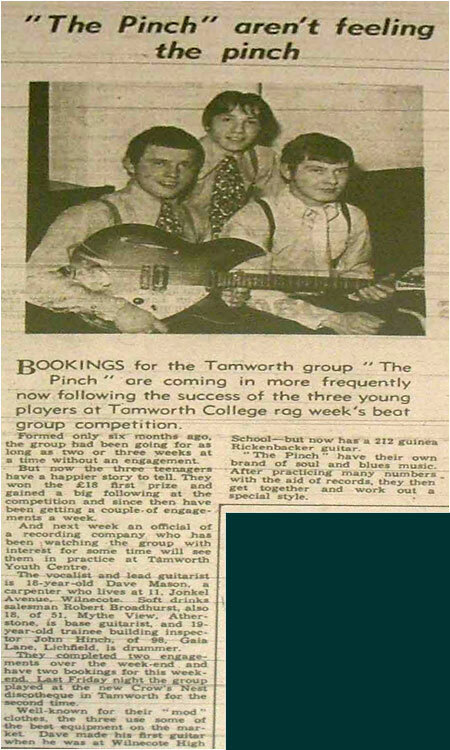 Bookings for the Tamworth group The Pinch our coming in more frequently now following the success of the three young players at Tamworth College Rag Week Beat Group Competition. Formed only six months ago, the group had been going for as long as two to three weeks at a time without an engagement. But now the three teenagers have a happier story to tell. They won the £18 first prize and gained a big following at the competition and since then have been getting a couple of engagements a week. And next week an official of a recording company who has been watching the group with interest for some time will see them in practice at Tamworth Youth Centre. 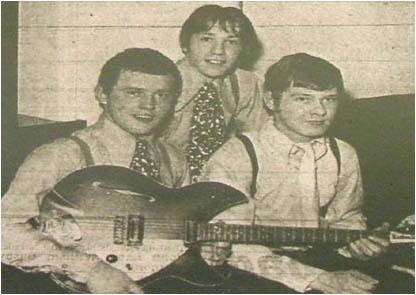 The vocalist and lead guitarist is 18-year-old Dave Mason, a carpenter in everyday life, who lives at 11 Jonkel Avenue, Wilnecote, soft drinks salesman Robert Broadhurst, also 18 of 51 Mythe View, Atherstone, and 19 year-old trainee building inspector John Hinch of 98 Gala Lane, Lichfield. They completed two engagements over the weekend and have another two bookings for this weekend. Last Friday night the group played the new Crow's Nest discotheque in Tamworth for the second time. Well known for their "mod" clothes they have some of the best equipment on the market. Dave made his first guitar when he was at Wilnecote High School - but now has a 212 guinee Rickenbacker guitar. The Pinch have their own brand of soul and blues music. After practising many numbers with the aid of records they then get together and work out a special style. This week's programme began with a Beat Group Competition in the Hall of the College of Further Education on Monday night where 300 students and friends danced to high-powered beat music and the players themselves competed for cash awards. Organisers of the college's third successive Rag are hopeful that at least £300 can be raised to be divided between the Save the Children Fund and Lady Hoare's Thalidomide Appeal. Five groups took part in the beat group competition. Judged by 14 students representing all full-time courses of the college. Each of the competing groups were chosen by a draw from the 13 who accepted the conditions and entered, played for 40 minutes. Scoring was based on the quality of music and singing, dress and presentation and speed and organisation. Bonus points were scored if the group took less than 10 minutes to set up their equipment and move it from the stage afterwards ready for the next group to takeover. Penalty points were deducted if it took more time. First prize of £18 went to "The Pinch" a local group formed only six months ago. Their 14 numbers were received enthusiastically. Members of The Pinch are 18-year-old Dave Mason, a carpenter in everyday life, who lives at 11 Jonkel Avenue, Wilnecote, soft drinks salesman Robert Broadhurst, also 18 of 51 Mythe View, Atherstone, and 19 year-old trainee building inspector John Hinch of 98 Gala Lane, Lichfield. The group was started at Dave's suggestion and he said "Bob and I won the competition two years ago when we were in another group which has since folded up." "Much to do about nothing" a team of five from Lichfield, gained the £9 second award. The competition was only the fourth engagement for the four-month-old group, whose players are Geoffrey Bywater, aged 20 of 15 St. Michael's Road, Lichfield; Dave Lindsey (19), of 69 Cherry Orchard, Lichfield; Phil Barker, of 24 Christchurch Lane, Lichfield; Steve Howkins, (18) of 44 Rykneld Street, Alrewas, and Terry Glazebrook, (18) of 16 Mallicot Close, Lichfield. Arranged by Betsy Woodward, a 17 year-old student at the college and one of the two main organisers of the Rag, the competition raised between £20 and £30 pounds. Ex-student Graham Hunter was the compere and electrician. Mr Patrick Rickwood the lecturer advising the Rag Committee, said the event was "an excellent send off for the week's events." The judges were Sandra Grubb, Angela Meer, Annette Grubb, Andrew Gould, Malcolm Macdonald, Brian Richardson, Matthew Purkiss, Alan Payne, Ann Shakeshaft, Cynthia Hardy, Susan Anning, Jonathan Soto, Tim Jakeman and Jean Ferris. The weeks "grand finale" - a rag ball with two beat groups - will be held in the hall tomorrow night.